I suppose you already have, but if you haven’t read my previous parts in this Exchange 2013 serie, have a look at the links below. 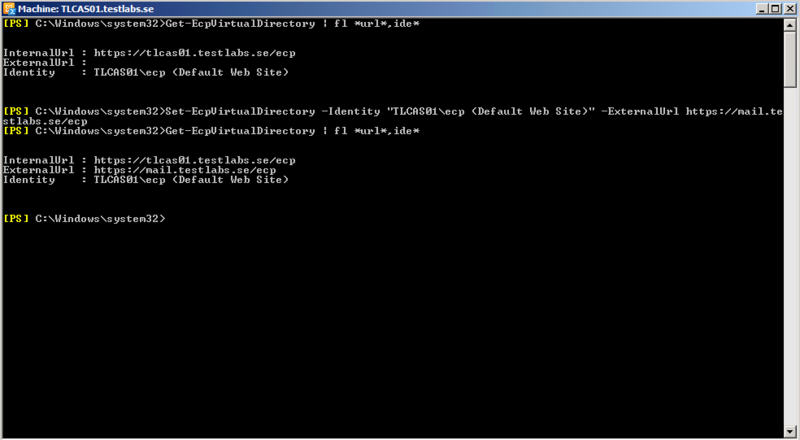 This part will include details on how the configuration could be made for Site URL’s/Virtual Directories, Databases, Outlook Anywhere and MAPI vs RPC over HTTPs together with connecting using Outlook 2013. 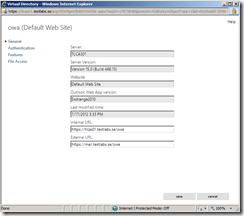 Let’s go through the steps for configuring the sites with the ExternalURL and other settings. 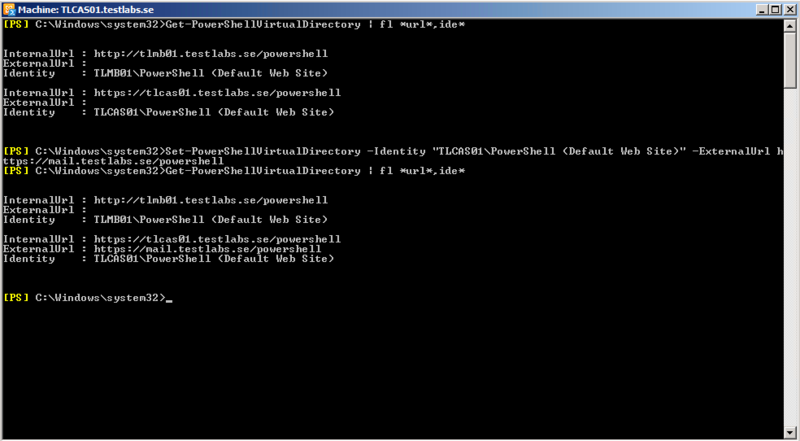 I’ll go through both the EAC and the PowerShell, so you have the opportunity to select which method you prefer. 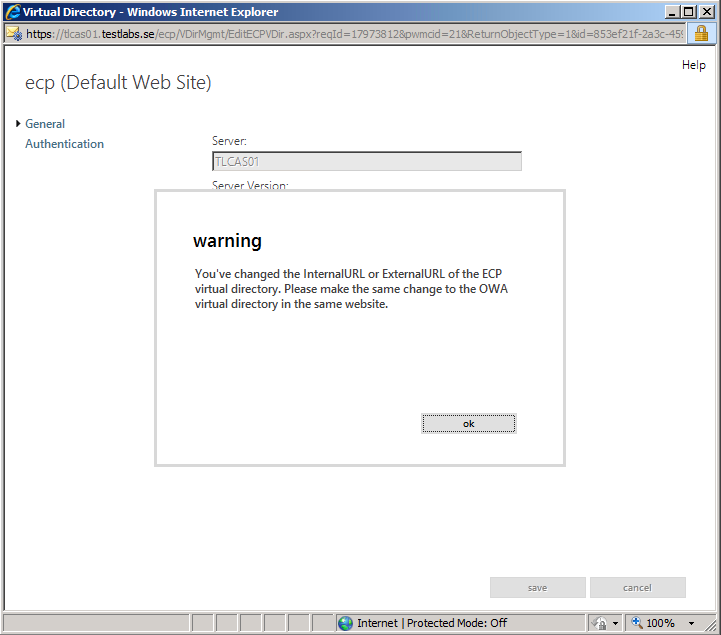 In EAC: Go to Servers, select Virtual Directories. 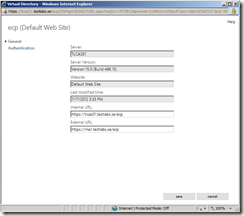 Select the server in the menu and which type you want to show. Then press Edit. 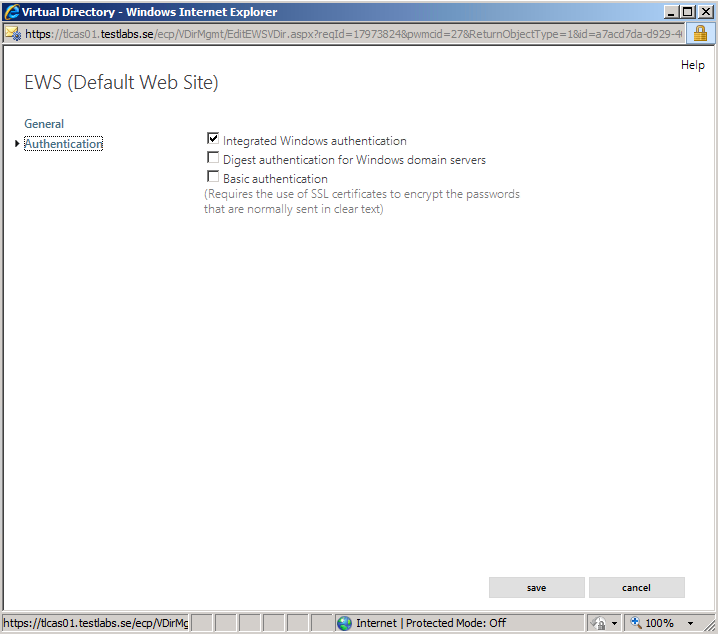 By default, Integrated Windows Authentication and Basic authentication is enabled. Press Save. 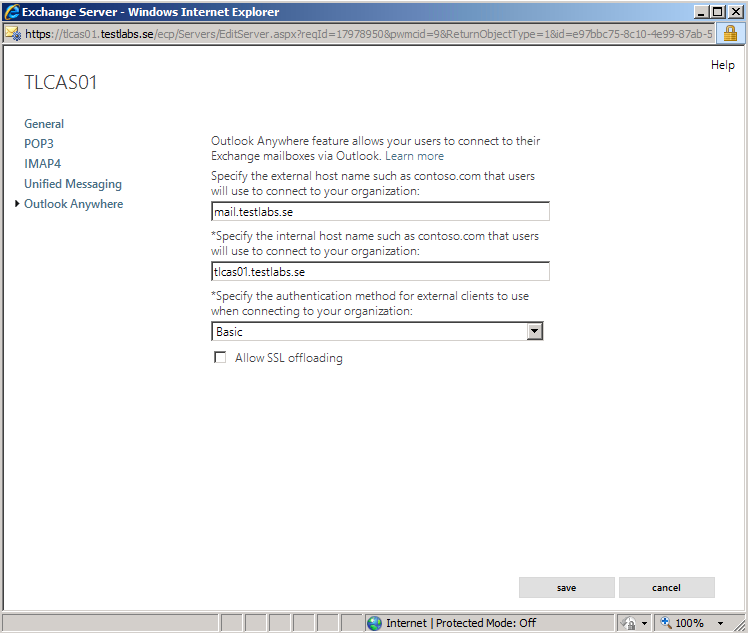 Next, select Exchange ActiveSync (EAS). Press Edit. 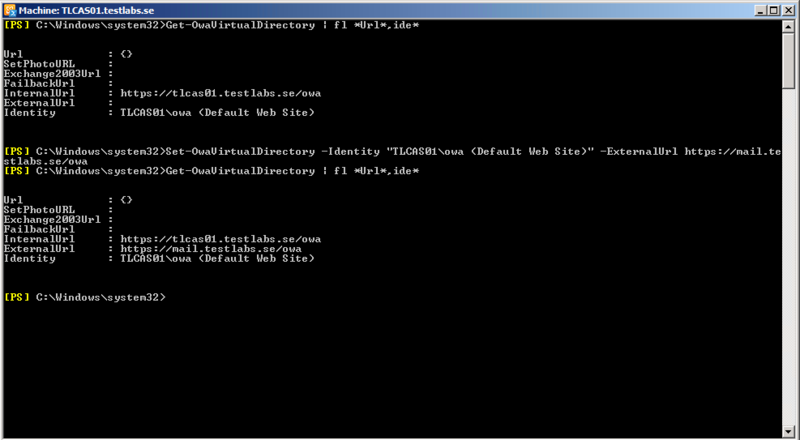 General settings shows the URL’s, I did type in the ExternalURL like the pic below. Press Authentication. 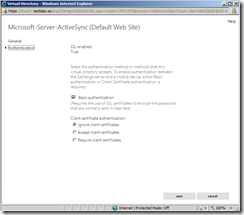 Make sure that Basic authentication is enabled. Press Save. Next, select ECP. Press Edit. 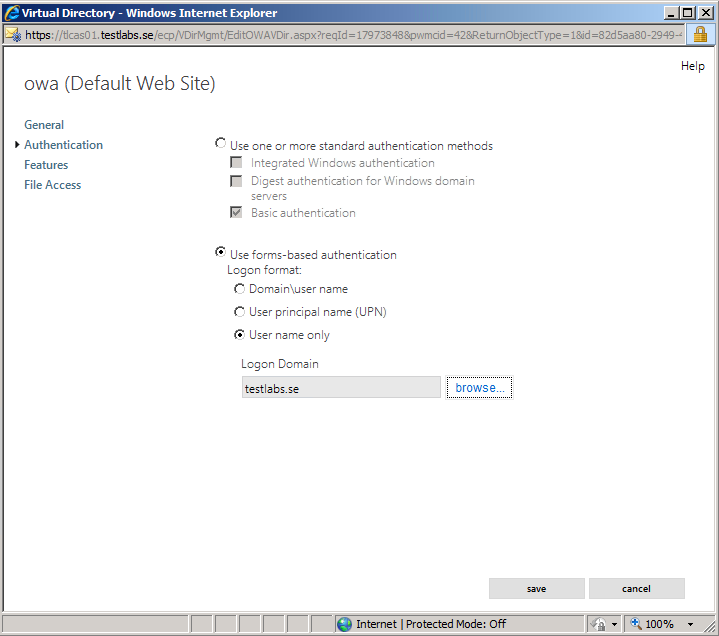 Authentication default settings is “Use forms-based authentication” enabled. Press Save. A warning, make sure to change all virtual directions. Press OK.
Next, select EWS. Press Edit. 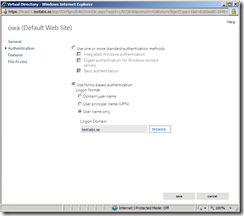 Authentication settings, Integrated Windows authentication is enabled by default. Press Save. Next, select OAB. Press Edit. I did type in the ExternalURL in this setting, the InternalURL was already configured. I did also change the Polling interval from 480 minutes to 60. For having a faster update of the OAB. Press Save. 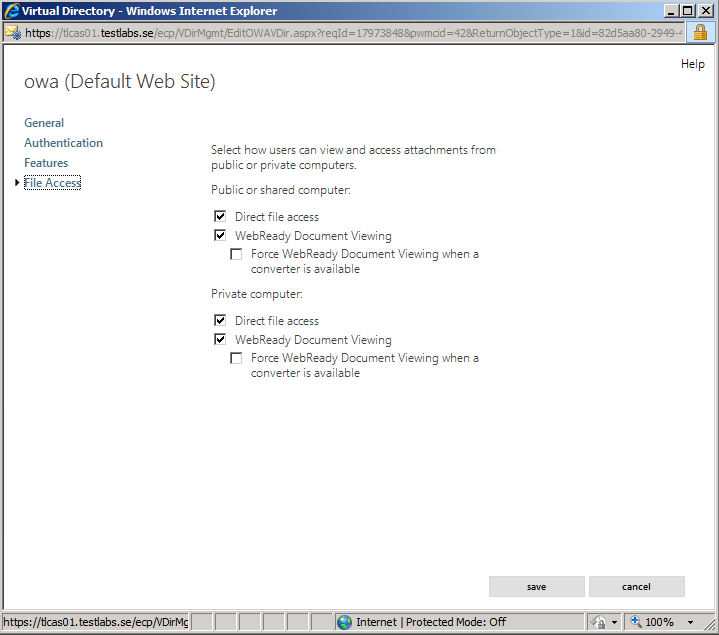 Next, select OWA. Press Edit. Forms-based authentication is selected, I did select the Logon format: User name only and did select my domain by the browsing button. Press Features. Showing the default settings. Press File Access. 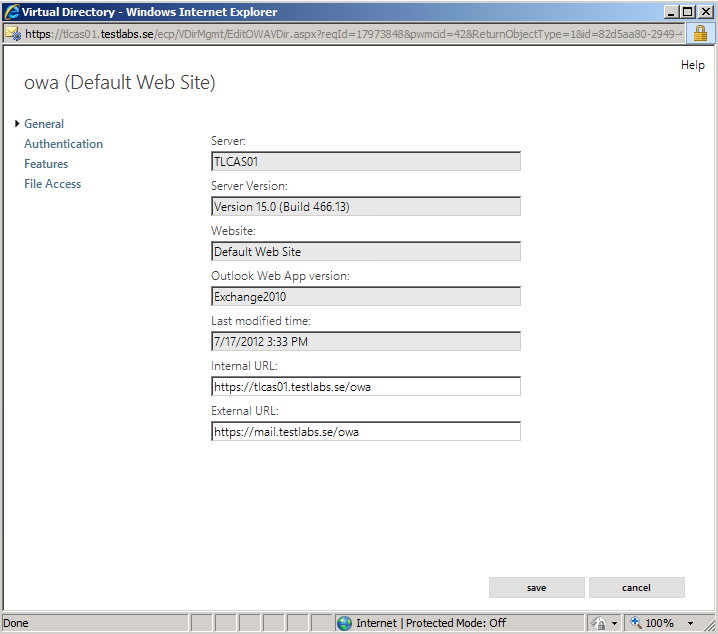 Showing the default settings. Press Save. 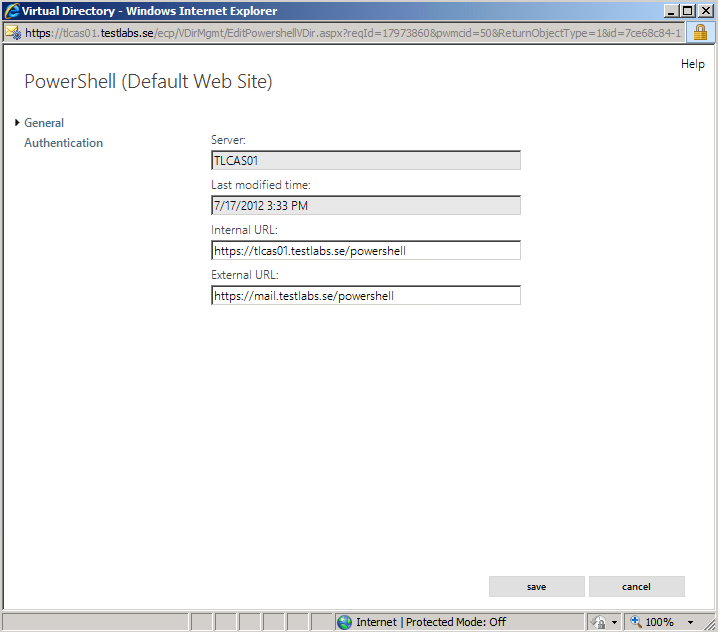 Next, select PowerShell. Press Edit. Both Integrated Windows authentication and Basic authentication was selected by default. Press Save. 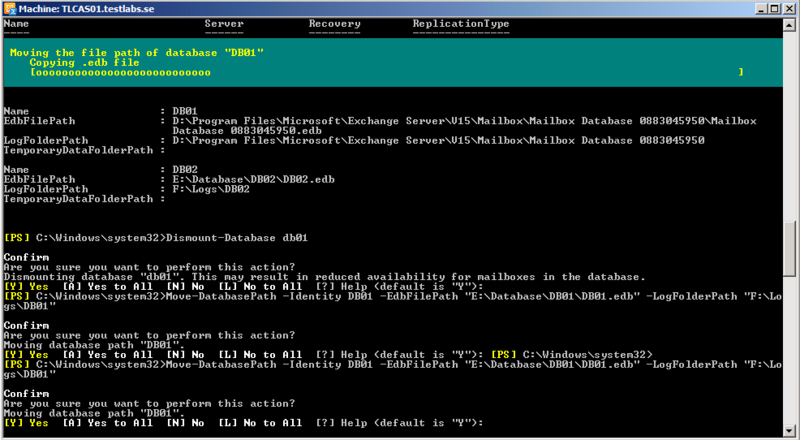 Start the Exchange Management Shell (EMS) and the following commands will do the same work that’s done in EAC. 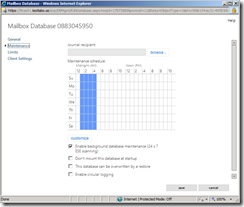 Let’s go through the steps that’s required for renaming the default database, dismount and mount. Also creating new databases. Let’s start with the EAC and then do it in PowerShell. 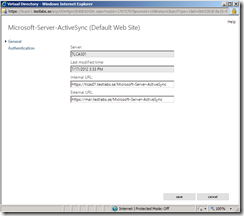 In EAC: Go to Servers, select Databases. 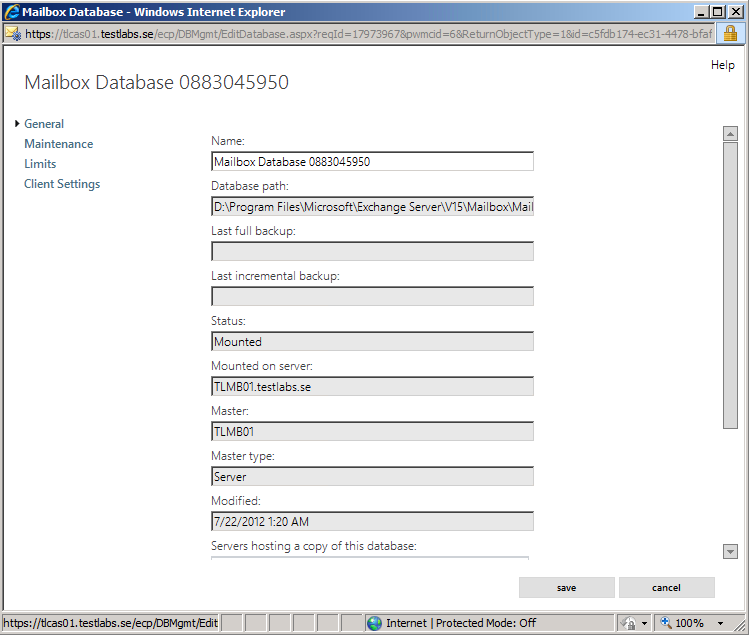 Select the default database, named “Mailbox Database 0883045..”. Press Edit. General settings is shown. Press Cancel. 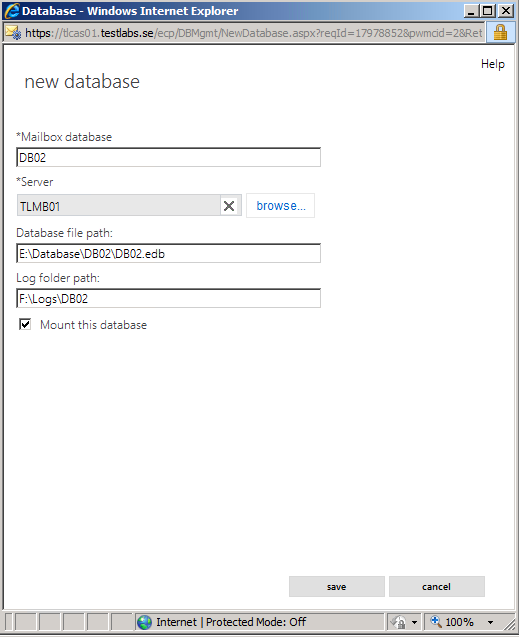 Select the database, Dismount it by pressing the … icon and press Dismount database. 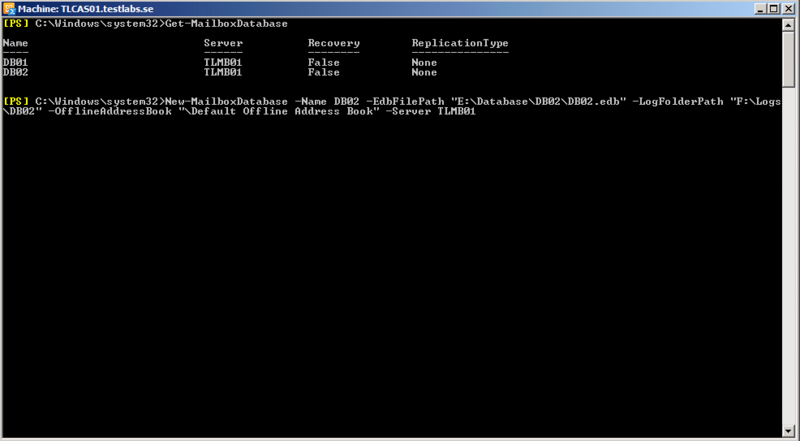 It does show a warning, that mailboxes being on this database now will be unavailable. Press Yes. Select the database. Press Edit. Give the database a friendly name, example: DB01. Press Maintenance. Maintenance settings is shown. Press Limits. Mailbox limits are shown, these are the default values. Press Client Settings. 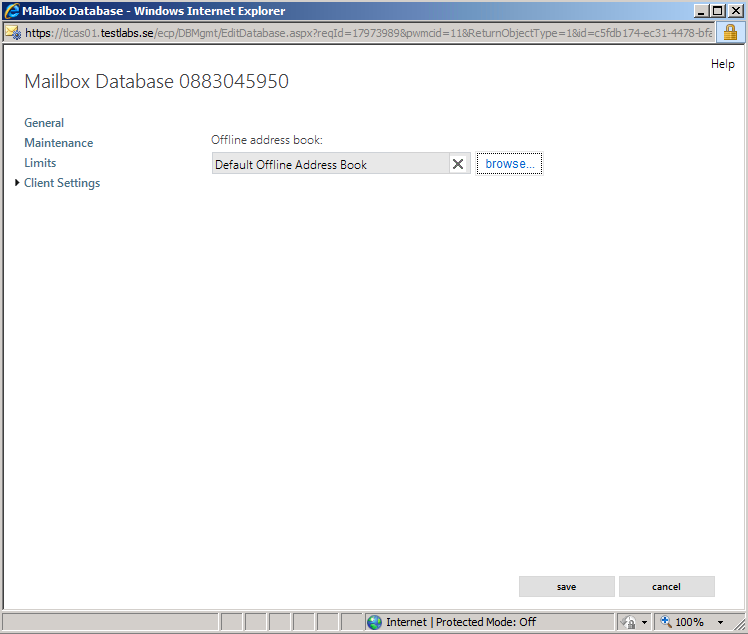 By default, no Offline address book was selected. Press Browse and make sure to select the address book. Press Save. 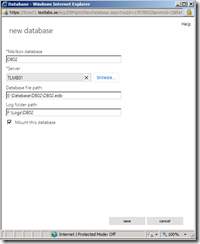 What about if you want to create a new database? Press the Add button (+). Give the database a friendly name, example: DB02. Browse for a mailbox server. 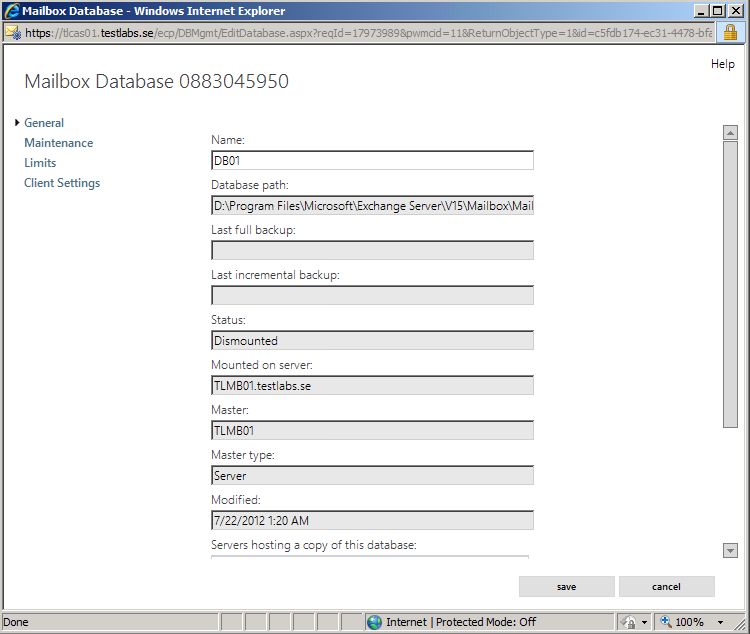 And also put in the database path and log path. Press Save. 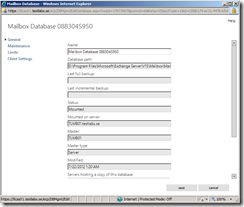 During the creating of the database, there is not option for associate the database with the offline address book. When the database is created, press Edit. 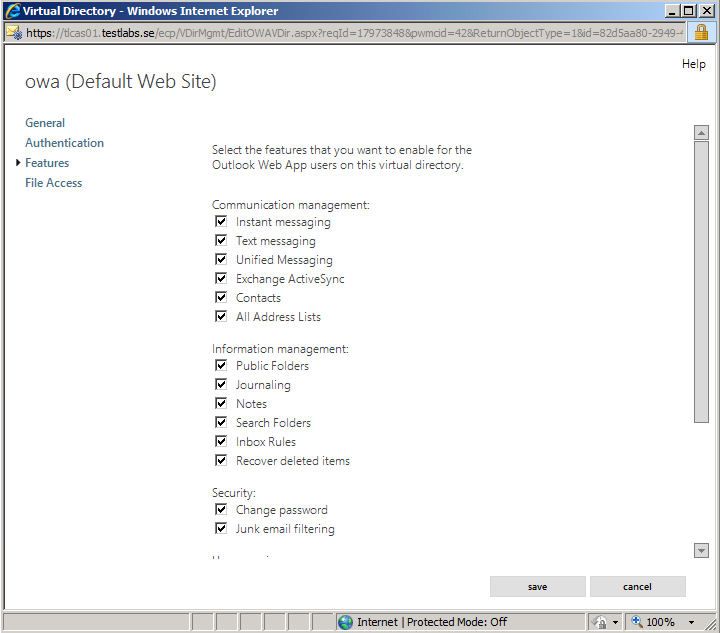 Then go to Client Settings and select the Offline address book. For creating a new database (DB02), we have the opportunity in PowerShell to specify all parameters that’s needed for having all options configured. 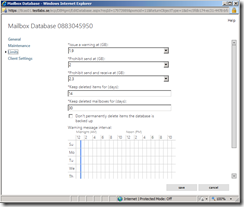 Note that the OfflineAddressBook is specified during the creation of the database. 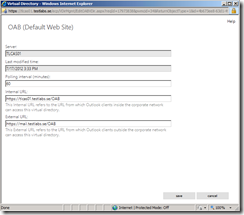 Configuration of the feature Outlook Anywhere can also be done from both the EAC and EMS, in various ways. Go to the servers menu, and select Servers. Press Edit. 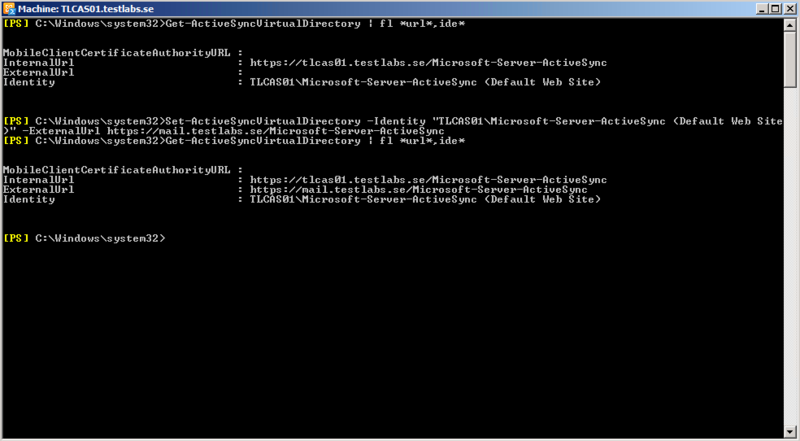 Then go to the “Outlook Anywhere” option, type in the external name, example: mail.testlabs.se. I’m using Basic authentication for Outlook Anywhere. Press Save. And the Configuration is completed. The MAPI/RPC (RPC over TCP) traffic is now gone and replaced with RPC over HTTP/s instead. With that said no more load balancing of static RPC ports, as far as I know this will make both the Firewall team and the Load Balancer teams work easier, less ports is used together with the requirement of load balancing affinity/sticky session settings is not required anymore. This because of there is no need anymore to have the affinity settings, it can now be load balanced based on IP addresses. 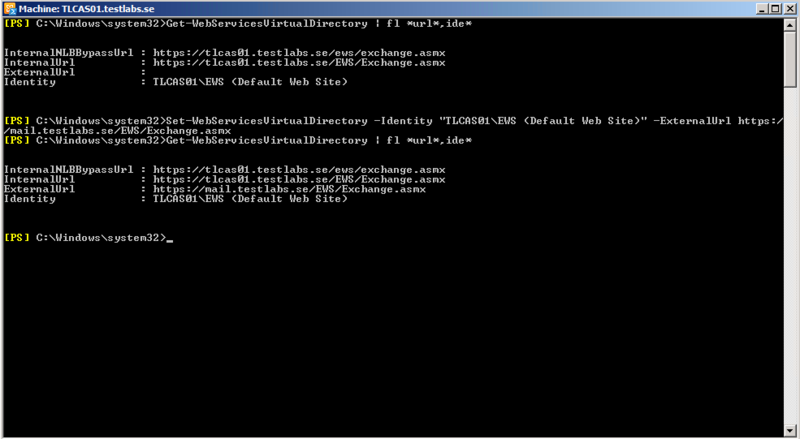 Just make sure that the load balancer verifies the Exchange services before sending traffic to it. 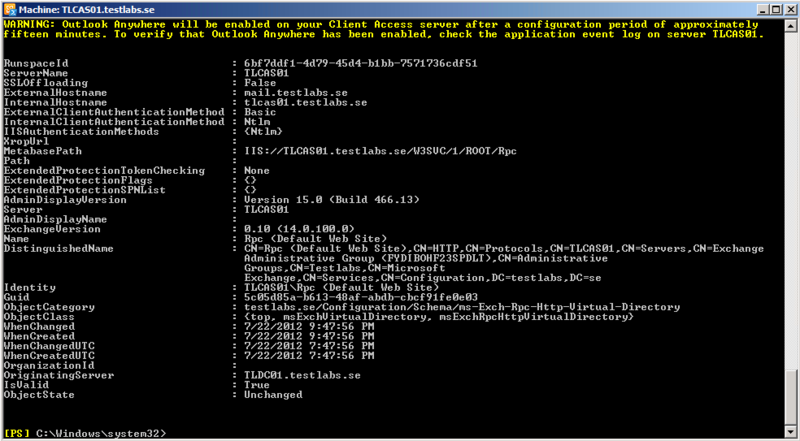 Outlook instead will use port 443 (HTTPS) or port 80 (HTTP). 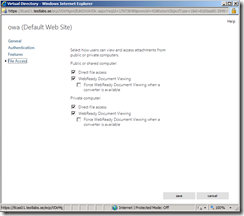 I think (and hope) most of you will use RPC over HTTPS, with this said I’ll show you the new Outlook 2013 Preview/beta and how it connects and also the traffic it’s using. 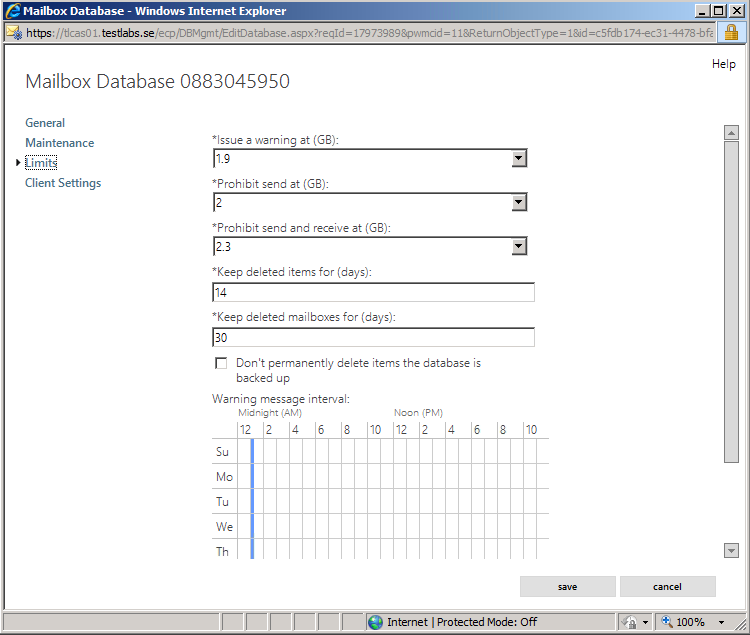 Outlook 2013 Preview, connects to my mailbox in Exchange 2013. 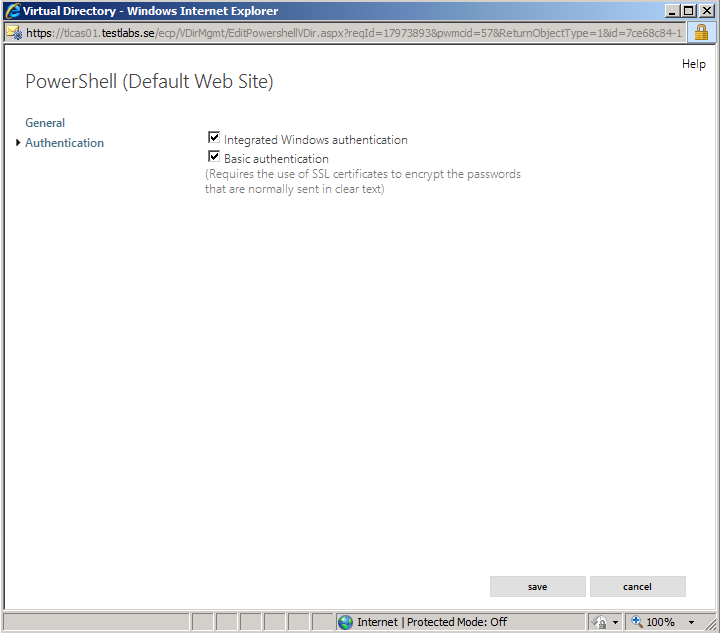 It’s using HTTPS to initiate the connection, using port 6001 by default for it’s connection, using RPC over HTTPS. 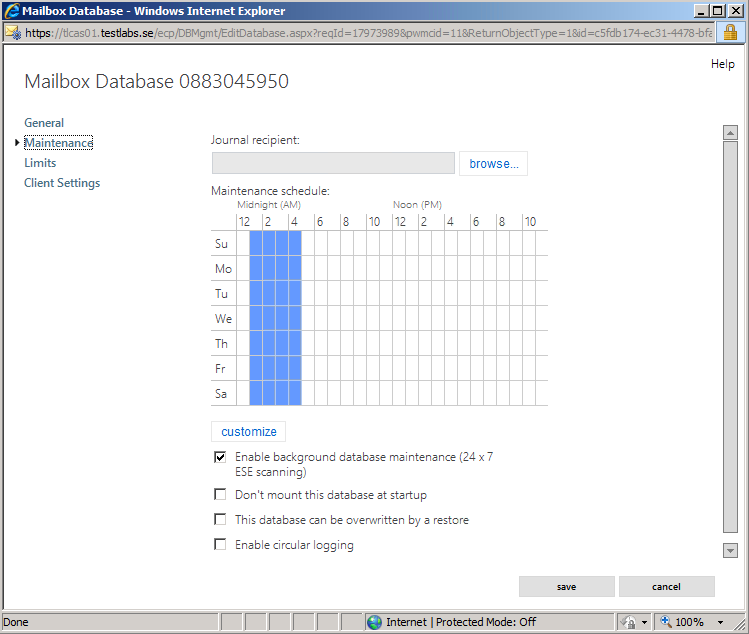 A small picture from Network Monitor when the connection initiated by Outlook 2013. 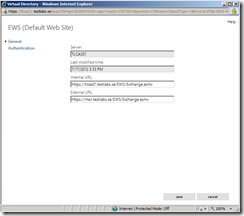 More information around What’s new in Exchange 2013 can be found here. 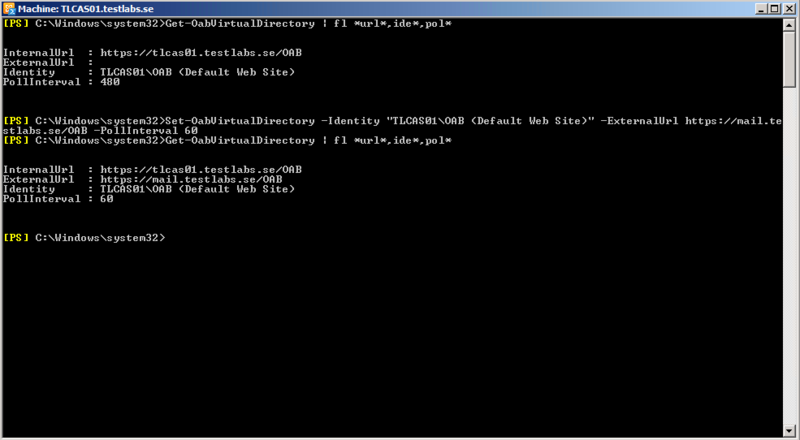 Next parts will cover Public Folders, Client Access Server Array, Database Availability Groups and more. Next part can be found here. Thanks for reading, I hope it helped you guys/girls out there. If you want me to cover anything special around Exchange 2013, leave a comment. Great ! 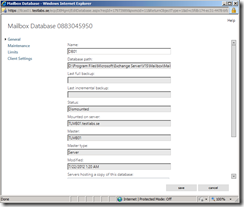 can you show us how to configure Exchange 2013 integration with LYNC 2013 in different forest not on different multiple server. 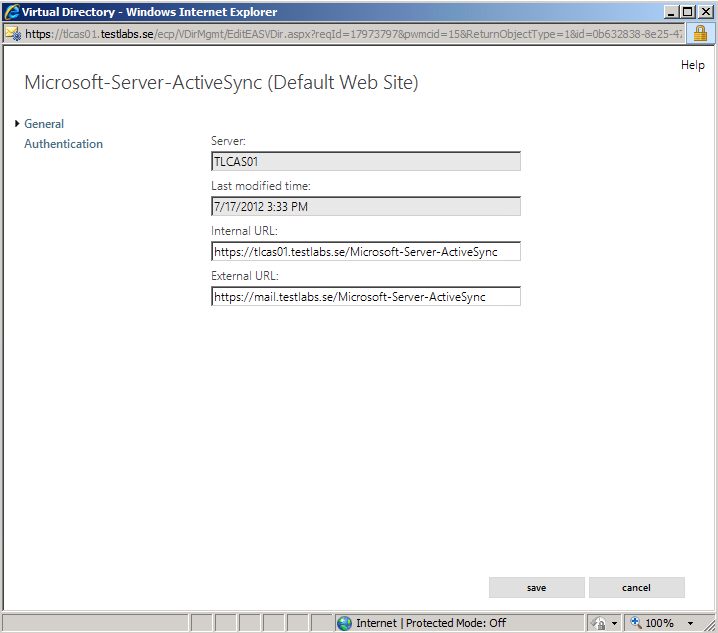 I ahve installed lync as a member server on 2012 , i have one AD, and Exchange on different Forest domain. AFAIK Lync must be installed in the same forest as Exchange is. I have very limited Lync knowledge, but I can refer to a great blog from Matt Landis regarding Lync integration and Lync related topics. I read your posts to fix some issues that I was having but I still get a issue with autodiscover where it puts a “=SMTP:” in front of the email name. Do you know what causes that? 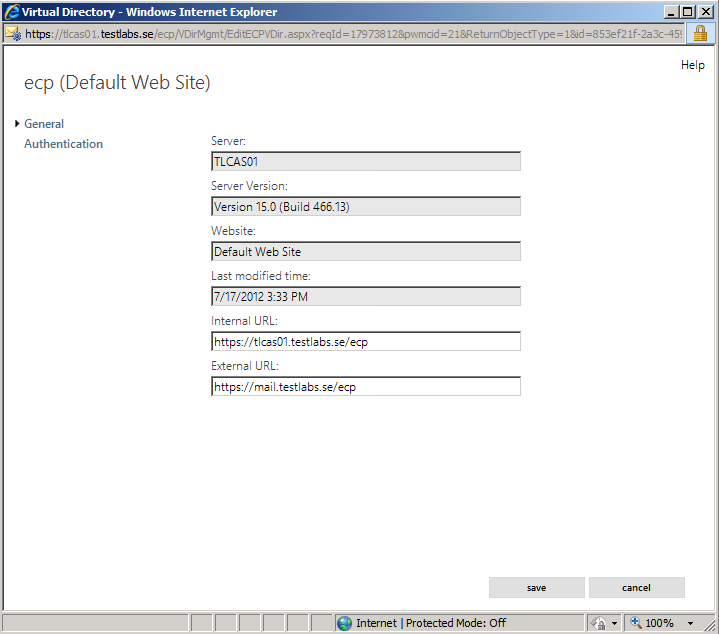 it helped me configure my new 2013 test-server. what i do notice is that my e-mail handling is very slow! 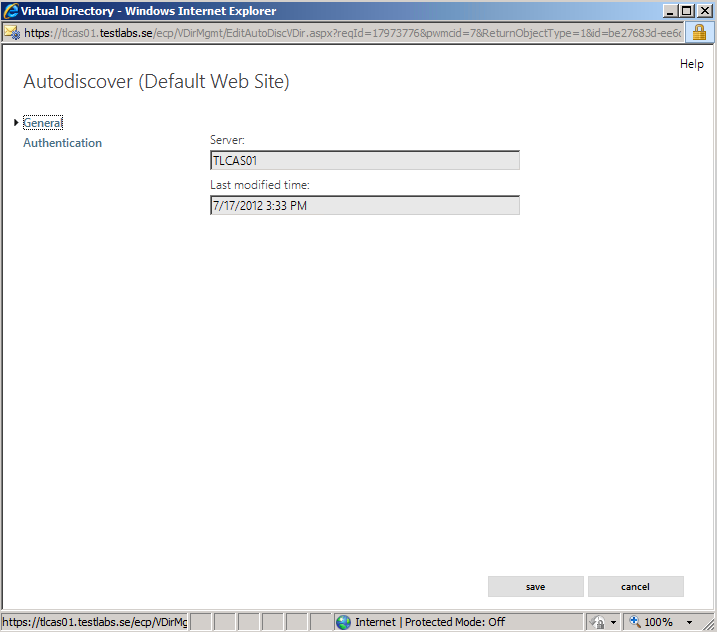 i’m using an external smarthost en i notice it takes 2 to 3 minutes for e-mail to be send. You have any idea where to look? Have you done any perfmon checking? Disk queue length? What’s the hardware sizing for your server(s)? 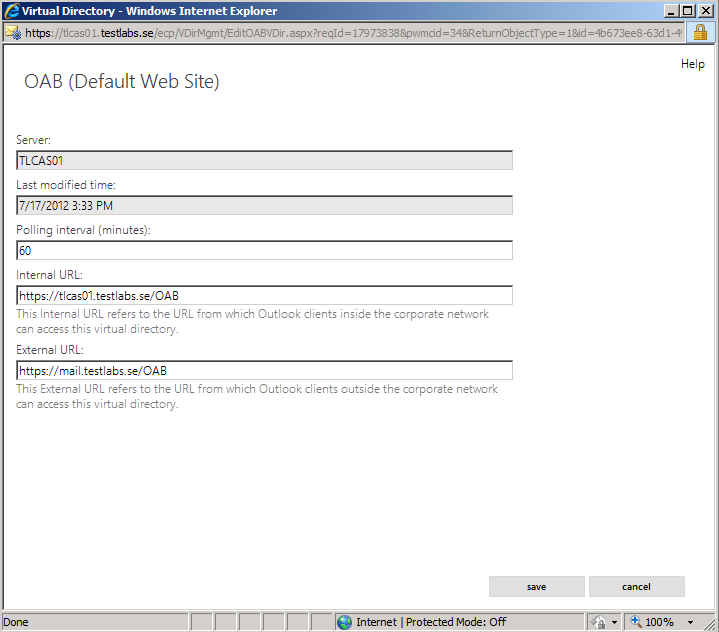 running on server 2012 hyper-v with 8GB for mbx and 4 for CAS. could it be a configuration issue in my send/receive connectors? In 2010 I had a script I downloaded, I assume that wont work. 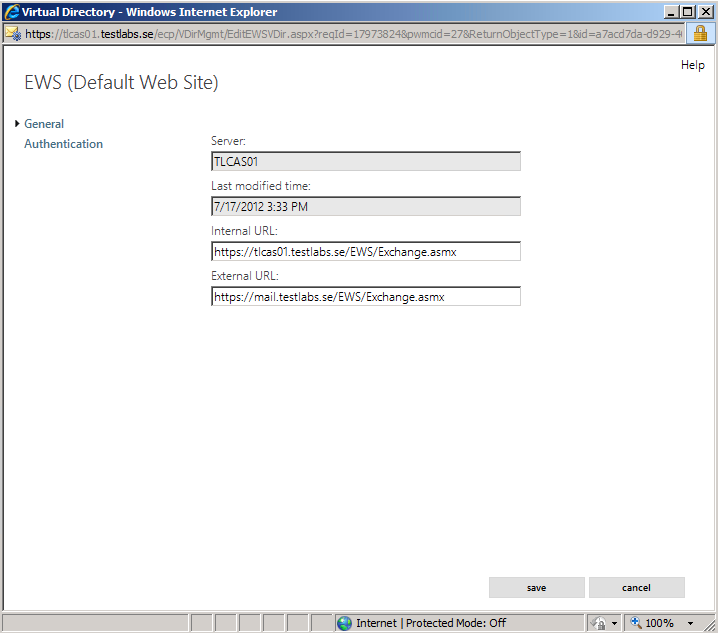 If I match the internal url to the external ones in EAC will that work? 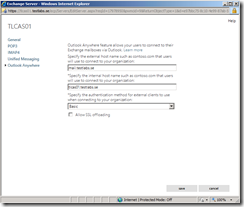 Probably the receive and send connectors..
Make sure that you have enabled the default connector for anonoymous users (default value) and that the send connector is allowed to send mails, check the fw port 25 so it’s opened. 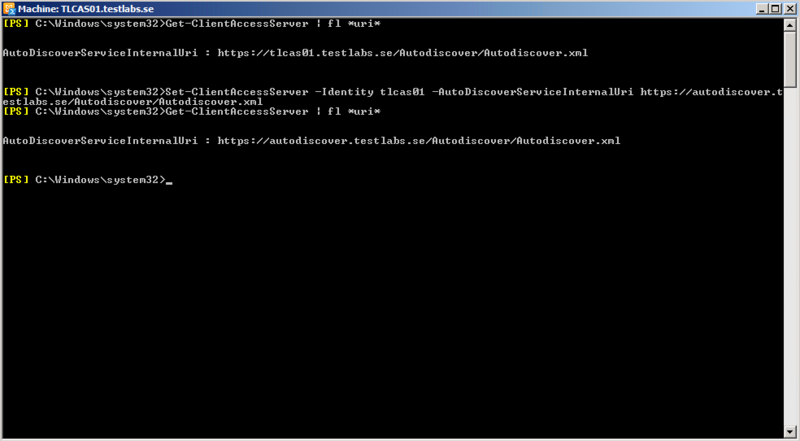 Also, start the verbose logging and check the log file for troubleshooting it. 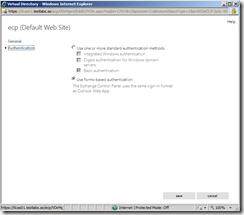 I have found this particular blog more helpful than anything on the net when I recently did a setup of Exchange 2013. There is one particular issue that I have recently run into and was hoping you may be able to shine some light on it. 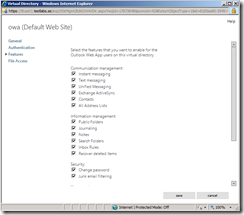 After the implementation, upon following your steps, OWA was working completely fine with no issues. 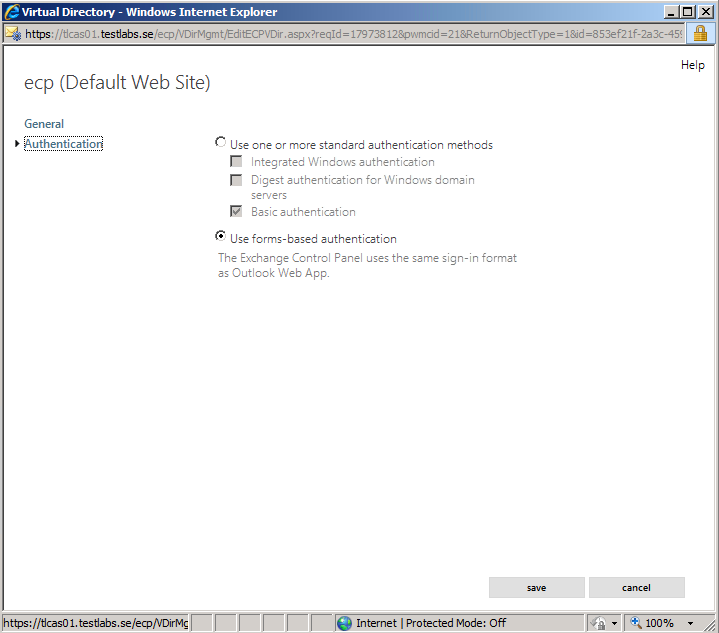 Fast forward to about a week ago, OWA has completely stopped working.. well, if I put in the IP of the exchange server locally “192.168.x.x/owa” it works, if I use https or switch to the server name mail.x.com/owa I get a sign in screen, I am able to sign in, but than get stuck on a loading screen. 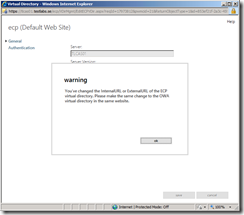 I have tried every trick, fix, etc.. that I have found on google, technet, etc.. but nothing has worked (most reference common issues in Exch03, 07 and 10) which unfortunately seems to have no effect for a 2013 implemention. If you have any ideas I would be very happy to hear them. I should also mention no additional software has been installed since nor have I done any patches to the OS or system files. 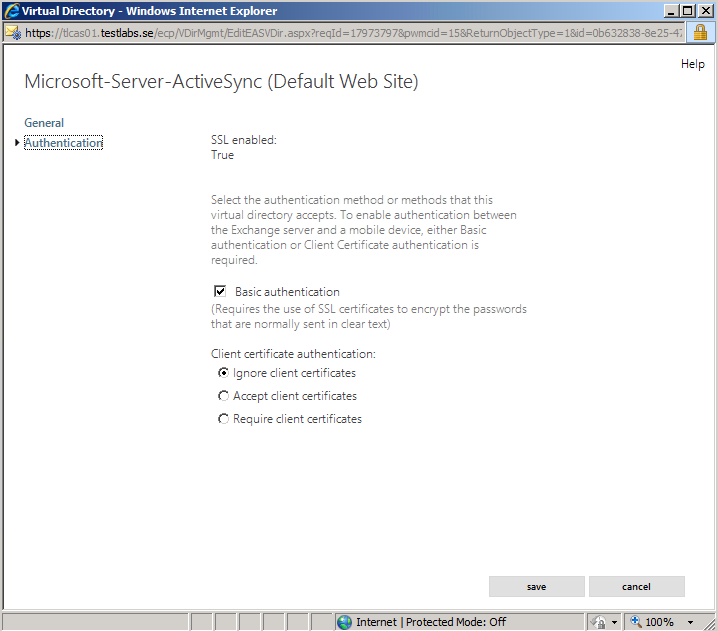 I use a 3rd party UCC SAN Certificate for SSL. The certificate is properly bound to the bindings on both the front and backend and registered through the root (since it was working previously). 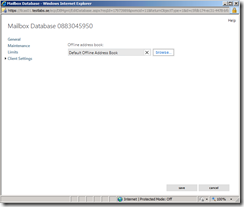 Hi I have Exchange 2013 all working i can get OWA to work and login no problems but i cannot get outlook 2013 to work it keeps saying outlook cannot log on, i have installed a sefl sign certifcate but i must be missing something ?? Alright, what does happen or does not happen? Excellent article . But still I have doubts about the URL. I have two CAS server say CAS1 and CAS2. Do I need to create the same URL for both the servers?? 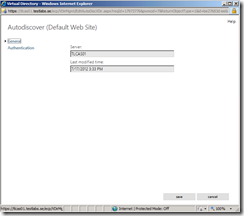 Do I need to do anything in DNS after URL creation. It’s really appreciated if you could give the reply soon. Yes, I would is my short answer but how does your configuration looks like?